Some unsolicited advice to the debate moderators at this Wednesday’s GOP debate: Ask Jeb Bush and Chris Christie about how they responded to Hurricanes Charley and Sandy, not how they feel about Hillary Clinton’s email server. Ask Carly Fiorina about her leadership of HP as the dot-com bubble burst around her, not about her run-ins with Donald Trump. Ask John Kasich how his parents’ death at the hands of drunk drivers reframed his views of the world, not if he is “more like Reagan” than the other candidates. The next president will likely face an unexpected crisis in the first year that will alter the trajectory of his (or her) presidency. Who is best prepared for those unanticipated moments is what voters should weigh most heavily when the Republican presidential candidates take the stage on in Boulder, Colorado, for the third GOP debate of the primary season. And the importance of crisis management should be reflected in the questions asked of the presidential contenders. Remember that it was just seven years ago this month that global markets went into free fall. Then-candidate Barack Obama probably did not envision his first priority as president would be to rebuild the global financial system, but events forced his hand. In the end, he was able to address the crisis and turn to his signature domestic priority—health care reform—but the recession consumed much of his attention that first year. His predecessor, George W. Bush, was less than eight months into his presidency when he had to formulate a response to the attacks of Sept. 11, 2001. Recall that this was the second national security crisis of his tenure, following a Chinese spy plane incident in April. By the time of 9/11, the Bush administration had already passed two legislative priorities—tax cuts and education reform—but the terrorist attacks altered the course of the next seven years. To be sure, 9/11 and the Great Recession were exceptional crises, greater than what many presidents ever faced. But they follow the almost inevitable rule that presidents will be challenged with unforeseen trials in their first year. Five weeks into his presidency, Bill Clinton also faced an attack on the World Trade Center, which left six dead and more than a thousand injured. Then on Oct. 3, 1993, U.S. Special Forces were ambushed during an operation in Mogadishu, Somalia. Eighteen soldiers were killed and scores injured during the mission, and the Clinton administration was left dealing with the aftermath. President George H.W. Bush awoke on March 24, 1989, a few months after he was sworn in, to the worst-ever oil spill on American territory when the Exxon Valdez ran aground. On June 4, the People’s Liberation Army brutally cracked down on a pro-democracy gathering in Beijing’s Tiananmen Square. And that fall, communist rule came to a swift and unexpected end across Eastern Europe, plunging the region, and the larger geo-political calculus, into uncertainty. 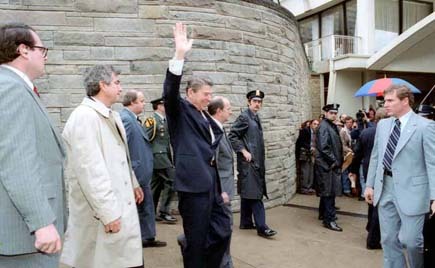 Barely two months into his term, Ronald Reagan suffered a near-fatal gunshot wound at the hands of John Hinckley, Jr. Upon return to office, he dealt with unexpected crises both at home (the August air traffic controllers strike) and abroad (Poland’s imposition of martial law in December). This period of first year crises is not an outlier in American history. The trend stretches back to the early days of the Republic. The “XYZ Affair,” a rift between the United States and France, began six months into John Adams’ presidency. Shortly after Thomas Jefferson took office he was thrust into the four-year First Barbary War—the first foreign military action authorized by Congress—when the Pasha of Tripoli declared war on the United States. Some of most significant national security crises occurred during first years. The Civil War commenced. The Maine was sunk. “Bleeding Kansas” was initiated. Harry Truman dropped the bomb on Japan. The Bay of Pigs invasion failed. Construction of the Berlin Wall began. Saigon fell. Economic crises have been just as common. Before the Great Recession came the Panic of 1837, the Black Friday of September 1869, the Panic of 1893, the Black Thursday and Black Tuesday of October 1929 and the apex of economic turmoil: The Great Depression. All were first year calamities. Crises have come in other forms. No one anticipated the deaths of presidents William Henry Harrison, Zachary Taylor or James Garfield in their first years. Leaders were ill-prepared for domestic unrest with the Great Railroad Strike of 1877, the Anthracite Coal Strike of 1902 or the Watts Riots of 1965. Few predicted the long-term impact of the Dred Scott decision in 1857. Today’s headlines already portend challenges for the 45th president. Across the globe, powder kegs abound—from Ukraine to Afghanistan to Syria, to name just a few. At home, racial tensions are at their highest point in decades. And some—like activist investor Carl Icahn, who declared recently that the stock market “joyride is over”—predict the next recession is right around the corner. History brings new meaning to that quadrennial question: Who is best prepared to lead the nation? How one responds to adversity is an undervalued, yet crucial, quality in our next president. Regardless of politics, every voter hopes the next president will buck the historical trend and govern through a period of peace and prosperity. But until that trend is broken, voters would be wise to consider carefully who they want in the Oval Office when crisis hits.